Manchester United's playing style is not what kit sponsor Adidas "want to see", according to the chief executive of the German sportswear giant. United began a £75m-a-year deal with Adidas at the start of the season. Herbert Hainer told Suddeutsche Zeitung "business with United is going very well" but expressed doubt about the team's "way of playing". Manager Louis van Gaal's possession-based approach has been criticised by fans, former players and the media. Saturday's 2-1 victory over Swansea was their first win in nine games, their worst run in 26 years. In that time, the Red Devils slipped out of the top four in the Premier League and went out of the Champions League at the group stage. Their record-breaking deal with Adidas is worth £750m over 10 years. Hainer said: "We sell more jerseys than expected, the foreign share is 60%. 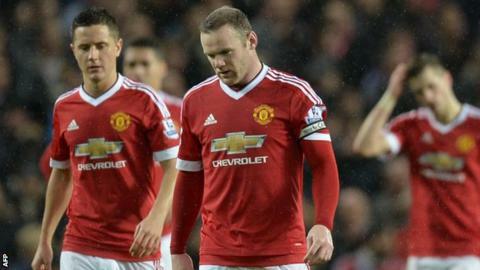 We are satisfied, even if the actual way of playing of United is not exactly what we want to see."